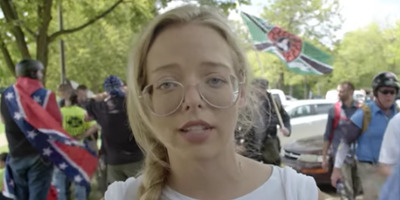 YouTubeElle Reeve, a reporter behind a viral documentary on a white supremacist rally in Charlottesville, Virginia, last August, says neo-Nazis continue to recognise her. Elle Reeve, a journalist for Vice News who filmed a viral documentary on the white supremacists who marched in Charlottesville, Virginia, last summer, says neo-Nazis continue to recognise her in public and make themselves known. Since Charlottesville and her widely viewed documentary on what occurred there, Reeve has also been approached by neo-Nazis in unexpected places – including, she says, airport security. Saturday marks the one-year anniversary of the Unite the Right rally in Charlottesville. Reeve has been covering white nationalism in the US for several years. By the time she arrived in Charlottesville last year, many of the neo-Nazis who were present already knew who she was, as well as intimate details about her life. Since Charlottesville and her widely viewed documentary on what occurred there, Reeve says she has been approached by neo-Nazis in unexpected places – including airport security. Reeve said she was going through security last Christmas and a male TSA officer recognised her. The event ultimately turned violent and resulted in the death of a counterprotester, Heather Heyer, who came out to express her opposition to the neo-Nazis as they marched. Heyer was killed when a man plowed his car into a group of counterprotesters.